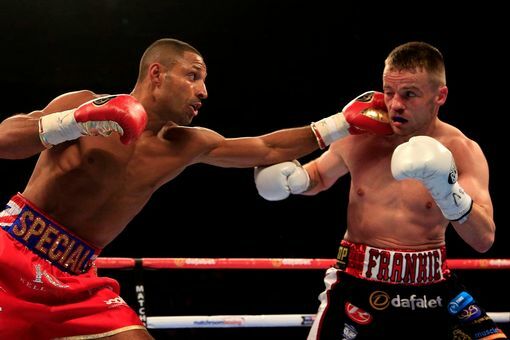 IBF Welterweight champion Kell Brook stopped Frankie Gavin in the sixth round of their title bout that headlined a bumper package of championship boxing in the O2 Arena, London. Southpaw Gavin never troubled the champion as his punches lacked the venom to unsettle Brook. The fight ended in the sixth when Brook rocked his opponent with several power punches before backing him up on the ropes with even more hurtful combinations. The referee intervened during the final seconds ending the punishment for Gavin. A unification bout with Mayweather seems out of reach for the moment for him, with Mayweather vacating his titles but there would certainly be interest in a fight between Khan and Brook. Boxing needs to move into a new era where the best are prepared to meet one another, so hopefully the agents and promoters can get make this fights happen soon. In other action, Lee Selby; the man dubbed ‘The Welsh Mayweather,’ won the IBF Featherweight title from Evgeny Gradovich via a unanimous point’s decision. Selby a technically gifted fighter boxed supremely, frustrating the bullish Gradovich with his movement and fighting from range. The fight ended prematurely when an accidental clash of heads in the seventh round, caused a nasty cut to Gradovich’s right eye. As a result of the clash the fight was called to a halt and it went to the judges’ scorecards who were unanimous in awarding Selby the decision. In his third bid for a world title a brave Kevin Mitchell was stopped in the tenth round of his WBC Lightweight clash with Jorge Linares. Mitchell began the fight well and managed to drop the champion in the fifth. Linares weathered the worst that Mitchell had to offer but his superior punching power was the difference. By the end of the tenth Mitchell’s face was bloodied and his vision impaired by badly swollen eyes. A barrage of punches from Linares dropped Mitchell to his knees and the referee brought an end to proceedings. Anthony Joshua continued his rise through the heavyweight ranks with a two round demolition of American Kevin Johnson. This was meant to be a step up in class for Joshua, as Johnson had gone the distance with Vitali Kiltschko, Tyson Fury and Derek Chisora. Joshua made it look easy, hardly breaking a sweat in the process. He dropped Johnson in the first round with combinations to the head and body. The second round was a repeat of the first and Johnson subsequently announced his retirement from boxing after the fight. Joshua appears to be the genuine article and it will be interesting to see how he is matched in the future. He made this test look easy and he is yet to go past three rounds. His punching power is tremendous but he needs the experience of fighting in the championship rounds if he is going to compete with the elite in the division.